Home Amihan DOST Northeast Monsoon PAG-ASA Tail-End of a Cold Front Tropical Depression Vinta Weather PAGASA Severe Weather Update for Tropical Storm "Vinta" as of 21 December 2017. PAGASA Severe Weather Update for Tropical Storm "Vinta" as of 21 December 2017. 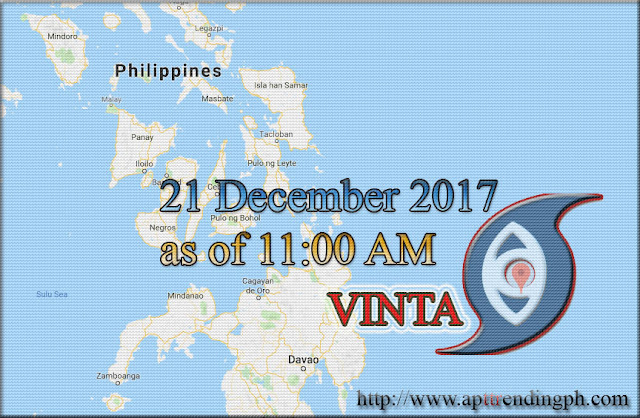 ISSUED AT:2:00 PM, 21 December 2017 - "VINTA" HAS SLIGHTLY ACCELERATED WHILE MAINTAINING ITS WESTWARD MOVEMENT TOWARD EASTERN MINDANAO. NEW UPDATE: PAGASA Weather Update for TS-Vinta as of 5:00 PM, 21 December 2017. At 1:00 PM today, the center of Tropical Storm "VINTA" was estimated based on all available data at 260 km East of Hinatuan, Surigao del Sur (08.4 °N, 128.7 °E) with maximum sustained winds of 65 kph near the center and gustiness of up to 80 kph moving move West at 21 kph. Weather Condition: Scattered to widespread moderate to heavy rains is expected over Central Visayas, Eastern Visayas, Caraga, Davao Region and Northern Mindanao within 24 hours. Travel Advisory: Sea travel is risky over the seaboards of areas under Tropical Cyclone Warning Signal (TCWS). ISSUED AT:11:00 AM, 21 December 2017 - "VINTA" HAS MAINTAINED ITS SPEED AND DIRECTION AS IT CONTINUES TO MOVE TOWARD EASTERN MINDANAO. Scattered to widespread moderate to heavy rains is expected over Central Visayas, Eastern Visayas, Caraga, Davao Region and Northern Mindanao within 24 hours. Residents of these areas must make appropriate actions against possible flooding and landslides, coordinate with their respective local disaster risk reduction and management offices, and continue monitoring for updates. Possible inclusion of Zamboanga del Norte, Zamboanga Sibugay, Southern part of Negros Oriental and of Negros Occidental in areas under TCWS No. 1 in the next bulletin. ISSUED AT:8:00 AM, 21 December 2017 - "VINTA" HAS MAINTAINED ITS STRENGTH AS IT MOVES TOWARDS THE DIRECTION OF EASTERN MINDANAO. At 7:00 AM today, the center of Tropical Storm "VINTA" was estimated based on all available data at 440 km East of Hinatuan, Surigao del Sur (08.7 °N, 130.3 °E) with maximum sustained winds of 65 kph near the center and gustiness of up to 80 kph moving West at 18 kph. Vinta is expected to make landfall over Caraga - Davao Region area between this evening and tomorrow morning (22 December) and by tomorrow morning: 80 km Northeast of Hinatuan, Surigao del Sur(8.8°N, 126.5°E). Scattered to widespread moderate to heavy rains is expected over Central Visayas, Eastern Visayas, Caraga, Davao Region and Northern Mindanao within 24 hours. Residents of these areas must Northernake appropriate actions against possible flooding and landslides, coordinate with their respective local disaster risk reduction and management offices, and continue monitoring for updates. Possible inclusion of Southern Cebu, Siquijor, and Misamis Occidental in areas under TCWS No. 1 in the next bulletin. 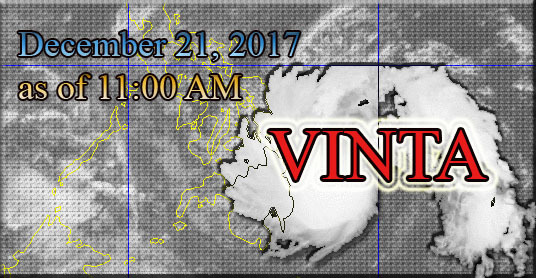 ISSUED AT:5:00 AM, 21 December 2017 - "VINTA" HAS INTENSIFIED INTO A TROPICAL STORM AS IT CONTINUES TO TRACK WESTWARD. At 4:00 AM today, the center of Tropical Storm "VINTA" was estimated based on all available data at 510 km East of Hinatuan, Surigao del Sur (09.0 °N, 130.9 °E) with maximum sustained winds of 65 kph near the center and gustiness of up to 80 kph moving West at 18 kph. Scattered to widespread moderate to heavy rains is expected over Eastern Visayas, Caraga and Davao Region within 24 hours. Residents of these areas must undertake precautionary measures, coordinate with their respective local disaster risk reduction and management offices, and continue monitoring for updates. Expected to make landfall over Caraga - Davao Region area between Thursday (December 21) evening and Friday (December 22) morning. TS "VINTA" will bring Occasional rains with gusty winds in areas of Northern Mindanao, Davao Region, CARAGA, Southern Leyte and North Cotabato while Cloudy skies withscattered rainshowers and thunderstorms in the rest of Mindanao and of Visayas. Tail-End of a Cold Front will bring Cloudy skies withscattered rainshowers and thunderstorms in Bicol Region, MIMAROPA, CALABARZON and the province of Aurora, Quezon including Polillo Island while Northeast Monsoon in Cagayan Valley and Cordillera. Metro Manila, Ilocos Region and the rest Central Luzon will experience Partly cloudy to cloudy skies with isolated rains due to Northeast Monsoon.